حادثه، بحران سپس جستجو، امداد و نجات چرخه‌ای است که بارها در کشوری همچون ایران تکرار می‌گردد. در این چرخه که به چرخه مدیریت بحران مشهور است، از مراحل نخستین یعنی تعیین خطرپذیری مناطق تا مراحل پس از بحران و بازیابی، با انواع داده و ستاده‌هایی مواجه‌ایم که به نوعی با مکان مرتبط هستند. گردآوری اطلاعات در مراحل پیش و پس از رخداد بحران، کار دشواری نخواهد بود، اما مادامی که جامعه در شرایط بحرانی به سر می‌برد، گردآوری اطلاعاتی همچون: حجم خسارت وارده، مناطق آسیب دیده، مناطق مستعد خطر، پراکنش خسارات، پراکنش منابع و .... بسیار سودمند و دشوار خواهد بود. از این رو در این پژوهش بر گردآوری اطلاعات در فاز واکنش مدیریت بحران تمرکز شد. در این راستا با بررسی مفهوم تله‌ژئوانفورماتیک و معماری‌های گوناگون آن، معماری از این مفهوم ارایه شد و سامانه واکنش اضطراری برای گردآوری اطلاعات در شرایط بحرانی زلزله پیاده سازی شد. این سامانه متشکل از چهار زیر سیستم تعیین موقعیت، گردآوری اطلاعات وضیعت موجود در مکان، ارسال و دریافت اطلاعات و ایجاد پایگاه داده و نمایش اطلاعات ارسالی است. در پایان، سامانه واکنش اضطراری طراحی شده به صورت بسته نرم‌افزاری ارائه شد. همچنین مدل این سامانه و نرم‌افزارهای آن در UML برای توسعه، توسط پژوهشگران دیگر، ارائه گشت. پس از پیاده سازی و تست این سامانه در شرایط عادی می‌توان چنین بیان نمود که، این سامانه به دلیل استفاده از فن‌آوری‌های موجود در کشور، سرعت بالای بکارگیری و پیاده‌سازی در هنگام زلزله، استفاده از فنآوری‌های عمومی همچون تلفن همراه، سادگی در بکارگیری و آموزش استفاده از آن، همچنین هزینه بسیار پایین پیاده‌سازی در شرایط کنونی بسیار مناسب و کاربردی است. از سوی دیگر به نظر می‌رسد این سامانه با بکارگیری توانایی پردازش کامپیوتر و فن‌آوری‌های نوین قابلیت بسیار بالایی در یاری رساندن به مدیران و خبرگان برای طراحی برنامه‌های عملیاتی و به اشتراک گزاری آن با دیگر ارگان‌ها و افراد درگیر در هنگام زلزله را دارد. Disaster, crisis and then the search, rescue and reliefis a cycle frequently repeated in a country like Iran. In this cycle, commonly known as the crisis management cycle, we are constantly faced with a variety of data and outputs from the early stages, namely, determining the risk of areas to the post-crisis stages and retrieval, which are somehow related to the location. Collectinginformation both in the pre and post-crisis stages will notbe a very difficult task, as the damaged society is then almost relieved from panic and therefore resources permit the authorities in charge to gather information as requiredHowever, during the crisis andas long as the society is suffering from critical conditions, collecting information such as the depth of damages, damaged areas, risk-prone areas, dispersion of damages, resources, facilities and … will be very useful and obviously difficult. Thus, considering the lack of tools andappropriate technology in the country for gathering information during crisis conditions, this research has focused on gathering information in the crisis management response phase. In this regard, concepts of Telegeoinformatics (TGI) and its various architectures were presented and continued with designing a system for gathering information during earthquake crisis. Finally, an emergency response system was designed and was presented as a software package. Moreover, the model and software of this system was presented in UML for further development by other researchers who are studying in the same fields, which resulted in presentation of suggestions for development of this system using other technologies. 1- صدری کیا، منصوره، (1386)، طراحی و توسعه یک سیستم نمونه اطلاعات مدیریت بحران با استفاده از WebGIS، پایان‌نامه کارشناسی ارشد، منصوریان علی،دانشگاه خواجه نصیرالدین طوسی، دانشکده نقشه‌برداری. 2- قانون تشکیل سازمان مدیریت بحران کشور، (1387)، فصل اول (تعاریف)، ماده1. 3- ملک و دلاور؛ محمدرضا و محمدرضا (1384)، یک سیستم اطلاعات مکانی همراه برای مدیریت امداد و نجات: مبانی و پیاده‌سازی، همایش ژئوماتیک 84، تهران، سازمان نقشه‌برداری کشور. 4- ملک و علی آبادی؛ محمدرضا و شمس الملوک، (1386)، مدیریت امداد در شهرها به کمک سیستم اطلاعات مکانی همراه، چاپ در مجموعه مقالات همایش GIS شهری، دانشگاه شمال، ص 1-11. 5- ملک، غضنفری، علی‌آبادی و دلاور؛ محمدرضا، سیدبهداد، شمس‌الملوک و محمود رضا، (1385)، نقشه‌های هوشمند در محیط‌های همراه و سیار برای مدیریت بحران، اولین همایش مقابله با سوانح طبیعی، تهران، 1385. 6- ناطقی الهی، فریبرز (1379)، مدیریت بحران ابر شهرها، انتشارات وزارت امور خارجه، تهران، چاپ اول، 222. 7- Arya, A. S., Karanth andA., A. Agarwal, (2006), Hazards, Disasters AndYour Community, Report of GoI-UNDP Disaster Risk Management Program, National Disaster Management Division, Emergency Management Australia, ISBN 1 921152 01 X, pp. 73. 8- Bai, X.,Fuyuan, X., Liu, J.,Daipeng, S., D. Yang, (2012), Mobile Game Design and Implementation Based on J2ME Technology,Proceeding of International Conference on Solid State Devices and Materials Science, pp. 1149-1154. 9- Bertrand Albala, I.M., (1993), Political Economy of Large Natural Disaster. Oxford, Clarendon Press. pp. 47. Central Board of Secondary Education, (2006), Natural Hazards and Disaster Management, Cbse, Delhi, India. 10- Cova, T.J., (1999), GIS in Emergency Management, In Geographic Information Systems, Application and Management, P.A. Longly, M.F. Goodchchild, D.L.Rhind, New York, John Wiley & Sons, pp. 845-858. 11- Derekenaris, G., Garofalakis, J., Makris, C., Prentzas, J., Sioutas, S., A. Tsakalidis. (2001), Integrating GIS, GPS and GSM technologies for the effective management of ambulances. Computers, Environment and Urban Systems, Vol. 25, No. 3, 267-278. 12- EL-Gamily, I.H., Selim, G,.E.A. Hermas, (2010), Wireless mobile field-based GIS science and technology for crisis management process: A case study of a fire event, Cairo, Egypt, The Egyptian Journal of Remote Sensing and Space Sciences, 13, pp. 21-29. 13- Hand, A., Cardiff, J., Magee, P., J. Doody, (2006), A structure and development methodology for location-based services, Electronic Commerce Research and Applications, Vol. 5, pp 201-208. 14- Hao-weia, Y., Wen-lia, D,. LIANG, D., Rogner, A., L. Jing-weid, (2011), Application of GIS on Emergency Rescue, Proceeding of the 5th Conference on Performance-based Fire and Fire Protection Engineering, Kowloon, Hong Kong, Procedia Engineering, Vol. 11, pp.158-188. 15- International Disaster Database (EM-DAT) (http://www.em-dat.net) visited on May 2015. 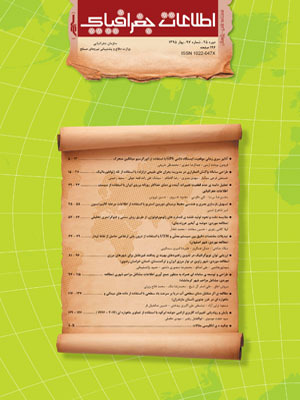 16- Karimi, H., A. Hammad, (2004), Telegeoinformatics Location-Based Computing and Services, CRC Press LLC, ISBN 0-203-50107-1. 17- Mansourian, A, (2005), Development of an SDI Conceptual Model and Web-based GIS to Facilitate Disaster Management, PhD Thesis, K.N. Toosi University of Technology, Faculty of Geodesy & Geomatics Eng. 18- Montoya, L., (2002), GIS and Remote Sensing in Urban Disaster Management, Proceeding of 5th AGILE Conference on Geographic Information Science, Palma (Balearic Islands, Spain), pp. 4. 19- Rasaneh, S.; Banirostam, T” .A New Structure and Routing Algorithm for Optimizing Energy Consumption in Wireless Sensor Network for Disaster Management, “Intelligent Systems Modelling & Simulation (ISMS), 2013 4th International Conference on, On page(s):481-485. 20- Smart, C,. I. Vertinsky, (1977), Designs for Crisis Decision Units, Administrative Science Quarterly, Vol. 22(4), pp. 640-657. 21- The VUSSC Team, (2006), Introduction to Disaster Management, Virtual University for Small States of the Commonwealth (VUSSC), (Disaster Management, Version 1.0), Vancouver, Canada, pp. 193. 22- Xuefei Li “An Intelligent System for Earthquake Early Warning, “Intelligent Systems and Applications (ISA), 2011 3rd International Workshop on, On page(s):1-4.